Whether you’re just starting out or firmly rooted, you need to have some basic tools around the house. Starter or homeowner toolkits combine all the tools you might need in a single package and often costs less than $75 dollars. 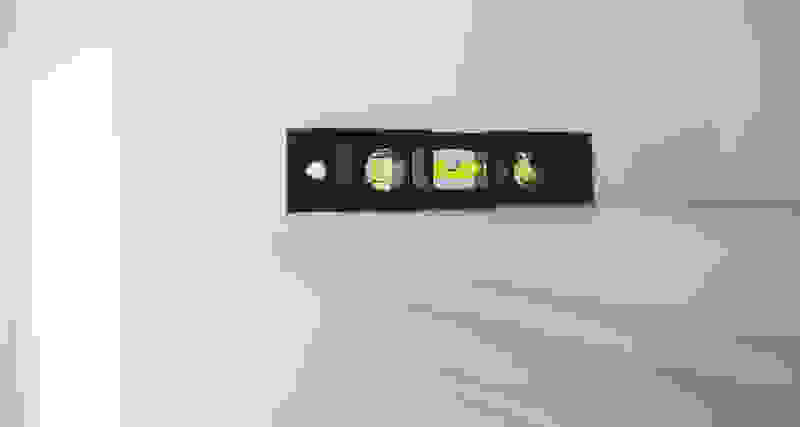 But it can be really confusing to choose between so many options, especially since every set offers a slightly different take on what an average homeowner needs, and cheap tools can do more damage than they fix. So we used several popular and affordable tool kits to perform some common household repairs, and separate the real deal from tool-shaped hunks of cheap metal. 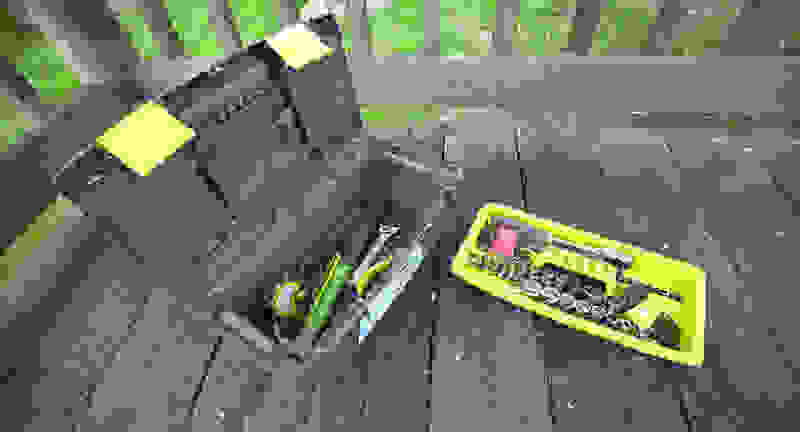 Bottom line: if you're looking for the best starter toolkit the Craftsman evolv 52-piece homeowner’s toolset (available at Sears for $39.99) is the way to go. With tools, it's absolutely true that you get what you pay for, but we found that you don't have to take out a second mortgage to get a basic set for hanging some pictures, assembling flat-stacked furniture, or upgrading a laptop. These are our picks for the best starter toolkits. UPDATE: This appears to be unavailable, but not yet discontinued. Check the links to Sears and Amazon. If it's not available, we also recommend the Stanley 65 piece homeowner’s tool kit. Historically, Craftsman has been known for making solid tools, giving them a lifetime warranty, and selling them for a good price. Even though the Craftsman evolv sub-brand is economy-minded, the materials and finishes in this kit are still high-quality. Combined with a good selection of tools and a smart design, it's easy to see how this 52-piece kit earned our top pick. Overall, this kit is more than adequate for what most people shopping for sets like this will need. 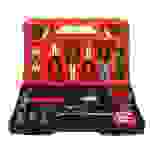 We especially like the toolbox, which is compact but offers room for growth that a molded case can’t. 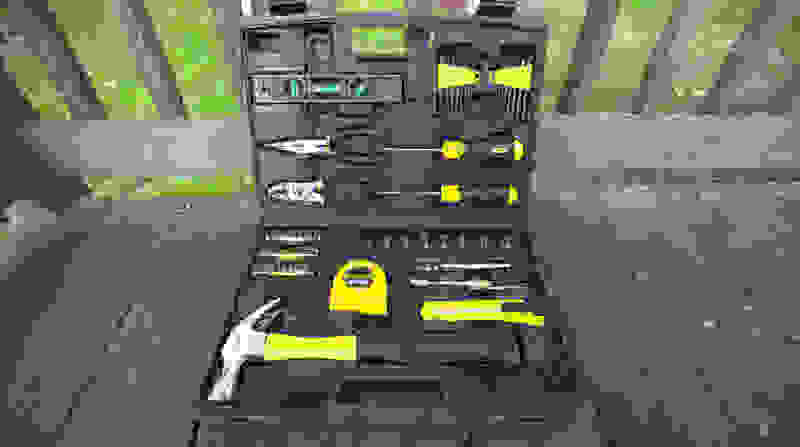 Although other sets in this price range include more items, the evolv set features 100-percent real tools you can rely on, and the best build quality of all the tool kits we tried. 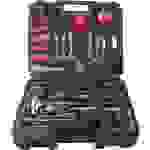 The evolv 52-piece toolkit by Craftsman is our top pick because of its overall value. That said, it also has some limitations. For example, some of the included sockets won’t fit on the ratchet without an adapter, which is not included. 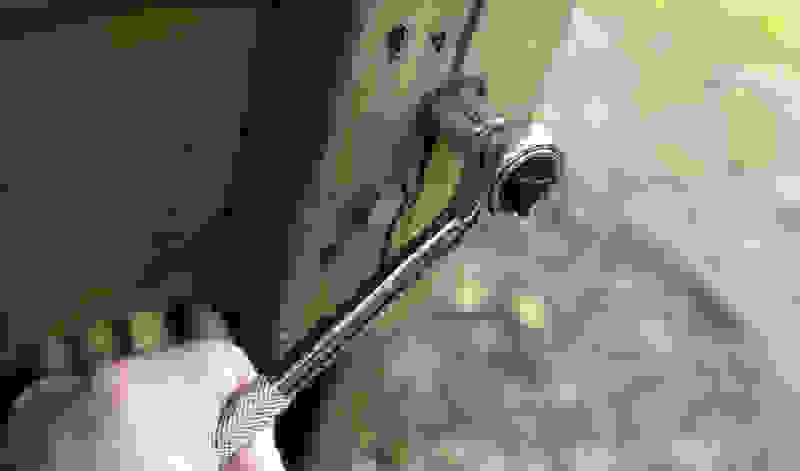 Some pieces—such as the adjustable wrench and the hammer—are on the small side, although the handles may still be too chunky to get into small spaces. But even with a few flaws, it still stood out among the other starter kits we tested. Stanley is another well-respected tool maker with a reputation for quality and durability, and that impression holds up with this tool kit. The manufacturing quality and materials are at the top of this class of high-value tools. For instance, the large hammer is sturdy and good for decades of serious work, just like the one I bought as a new homeowner nearly 20 years ago, that’s still pounding nails with authority. Ergonomic handgrips on the screwdrivers allow you to exert force without tiring out your hand. Both needle-nose and standard slip-joint pliers are included, as well. Although the tools themselves are superb, the low-profile molded case leaves something to be desired. 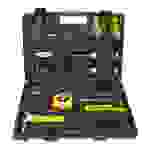 It stores easily but offers no room for storing any additional tools you may buy. That’s a real possibility, too, because there are some things noticeably missing here. The ratchet is just a 1/4-inch drive versus the 3/8-inch drive found in the other sets. It’s compact but less robust for heavier-duty tasks. There’s also no adjustable wrench, a really handy piece of homeowner tool weaponry. The case itself makes it hard to remove and replace items, and some stuff fell out every time I closed it. Testing involved using these tools as an average homeowner, putting commonly used tools through their paces with jobs most people have to do around the house. Indoor repair tasks included adjusting a bathroom shower valve with an Allen key, and light appliance repair and maintenance to see whether the sizes of screwdriver bits, wrenches, and sockets were useful. Outdoors, we did some bicycle assembly and maintenance to test the fit and feel of Allen keys and wrenches and drove lag bolts into deck railings with ratchets and sockets to test tool strength. A ratchet and socket need to hold up during a tough job like tightening a lag bolt on a deck. To test tape measures, hammers, screwdrivers, and levels, we put up some bedroom shelves. By adjusting, tightening, and repairing various items including a child's bed frame, a dinette set, and an antique table, we also found that any of these kits would do a fine job assembling flat-pack furniture. Despite the name, this set is equally useful indoors as well as out in the garage. Uncommon items such as snips and locking pliers expand your possibilities. Quality isn’t as nice as the Craftsman or the Stanley kit, but there’s a lot more here. Even experienced mechanics or handymen may like this as a spare set to keep around. One nice touch with this set is that the case has screw holes for wall-mounting. It’s got the widest assortment of individual screwdrivers among the sets we tried with several sizes of flathead, Phillips, and even Torx. The hammer is beefy, and there’s a wide array of nut-driver sizes and lots of additional bits for the ratcheting handle. There’s also a 3/8-inch drive ratchet, a solid selection of sockets, and combination wrenches in both inch and metric. This HDX set from Home Depot offered the most variety, although it might be overkill for some homeowners. For many homeowners, however, all this variety may be overkill. If you don’t ever expect to fiddle with the blade on your lawnmower, change your own oil, or cut a piece of metal flashing, this may not be the kit for you. The molded case that doubles as a cabinet doesn't have any places to store additional tools, so you’ll have to find room for another toolbox if you start adding more tools. This is yet another interpretation of what makes an ideal homeowner’s toolset. That means quite a bit of variety; lots of sockets, the fullest assortment of pliers, and even 8 spring clamps (2 larger, 6 smaller). There’s a 3/8-inch drive ratchet, but not all the sockets are 3/8-inch drive. Fortunately, there’s a 3/8-inch to 1/4-inch adapter included, so they can all be used with the ratchet. There’s slip-joint, needle-nose, linesman, and side-cutting pliers, and the spring clamps are an interesting choice that might come in handy for craft projects, too. This set from Olympia Tools/iWork was fine—but others we tested were better values. There are only two screwdrivers included, as well as a ratcheting bit driver. There are no wrenches of any kind, either—a notable omission. Quality is roughly equal to the HDX set but not as good as Stanley or Craftsman. Again, the molded case limits growth, but this one seems more robust than the others, and items tend to stay put. 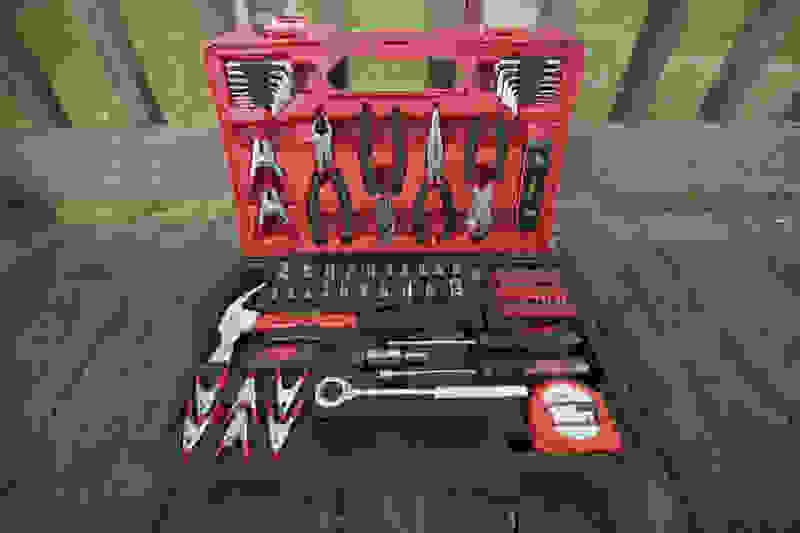 Shoppers may find this same set sold under the Olympia Tools or iWork brands, or sometimes both. 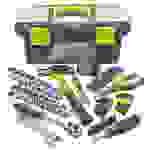 This set offers lots of tools but misses on the quality. Little details appear to be glossed over. 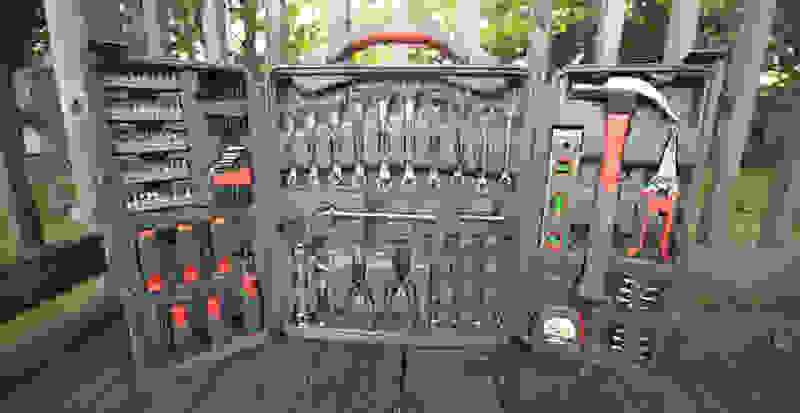 For example, the jaws of the pliers don’t line up cleanly, the machine work on the ratchet handle is sloppy, and the tools feel cheap in your hands. That said, for light-to-medium duty work it’s likely fine. There’s a good selection of tools here: a 3/8-inch drive ratchet, combination wrenches, needle-nose, and side-cutting pliers, lots of sockets in both inch and metric sizes plus two different lengths of extensions. 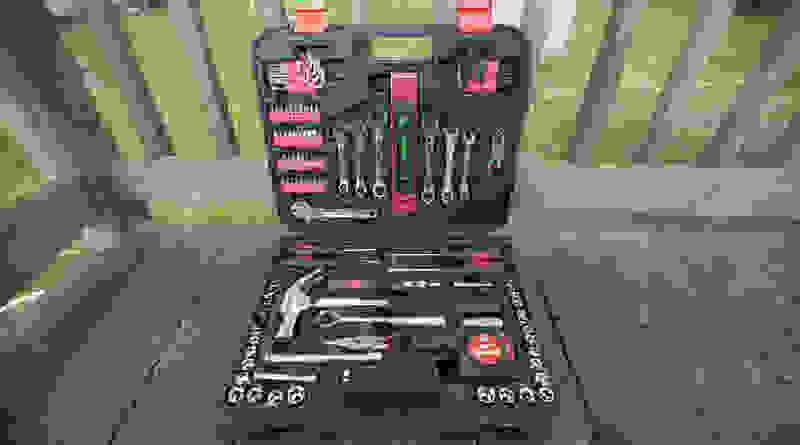 If you want to maintain bikes and yard gear as well as hang pictures and fix stuff around the house, this kit can probably handle it, but so can the even more comprehensive HDX set that has better quality. We preferred our top-ranked sets to this kit from Great Neck/iWork. Again, this set’s molded case has the tendency to drop items as you’re trying to close the lid, as well. Be aware, Sears stores carry this very same toolset for $39.99 branded as iWork instead of Great Neck.